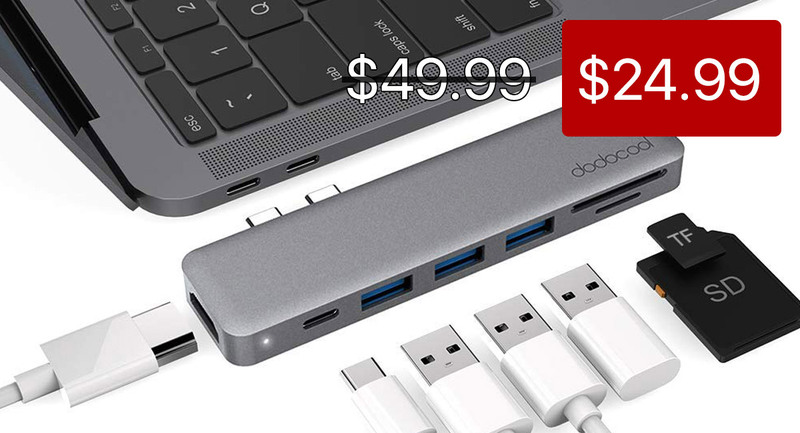 This multi-use, extremely diverse dodocool USB-C hub, which offers a 7-in-1 experience, is on offer right now with a whopping 50% discount. This is a deal that will instantly appeal to anyone who owns one of Apple’s new MacBook computers. USB hubs and adapters have always been extremely popular in the accessory world. Historically speaking, these hubs have always been quite cheap and have allowed people to buy them and connect an additional one or two items to their machines. However, with Apple deciding to release new MacBook hardware with USB-C, it means that these gadgets are becoming even more popular as people look for a way to use their existing accessories with the new machines. Increased demand and increased power also generally means an increased cost. 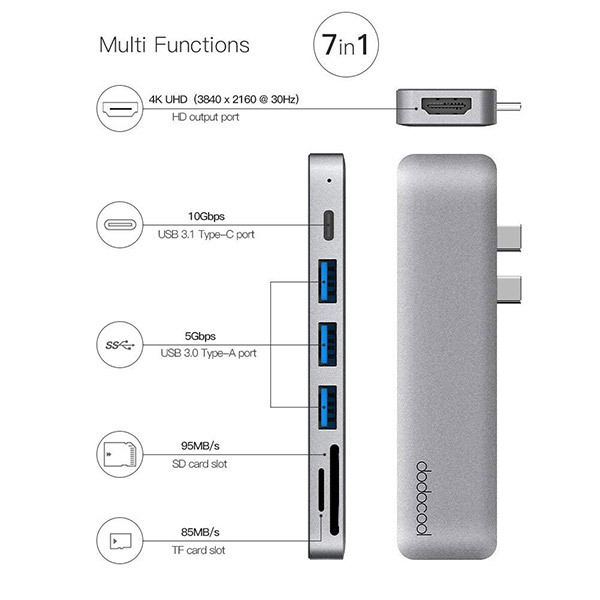 dodocool Aluminum Alloy 7-in-1 Multiport Hub with Dual USB-C Connectors easily adds three USB 3.0 Type-A ports, one HD output port, one TF card slot, one SD card slot and one USB 3.1 Type-C port. An ideal solution for your MacBook Air 2018, 13-inch or 15-inch MacBook Pro with two available Thunderbolt 3 (USB-C) ports. This stylish, compact device doesn’t require an external power supply, so it fits neatly on an office. You also can slide it easily into your bag on business trips. It offers a data transfer rate of up to 5Gbps for its USB 3.0 ports and up to 10Gbps on the USB 3.1 ports while the SD card slots will support cards up to a maximum capacity of 512GB. Note that you will need macOS High Sierra or above running on the Mac in order to be able to successfully use this accessory. If this is something that you need then you should be grabbing it right now whilst you can benefit from this deal.